Back in February I was approached by a local fitness company, then called Fitn, to help spread the word about their fitness platform in exchange for membership. I was beyond thrilled and now that Fitn has had a facelift and is now called Wildfire, nothing has changed in terms of my satisfaction. Wildfire has made working out during my pregnancy fulfilling, diverse, motivating and FUN! I’ve always loved group fitness classes but because endurance racing is my main focus, running (and in years past biking and swimming) took center stage. I’d occasionally drop in a yoga class but never actually signed up for a membership because I didn’t think that it would be worth the money for me given the time I had available to devote to it. I did become a member at Club Pilates, but even then I was only really able to dedicate 2 classes per week to it. I’ve dabbled, but never really stuck with one thing. Wildfire not only supports dabbling, it promotes it – for one membership price, you are given access to literally over a hundred local fitness studios and are encouraged to visit as many of them as often as you’d like! 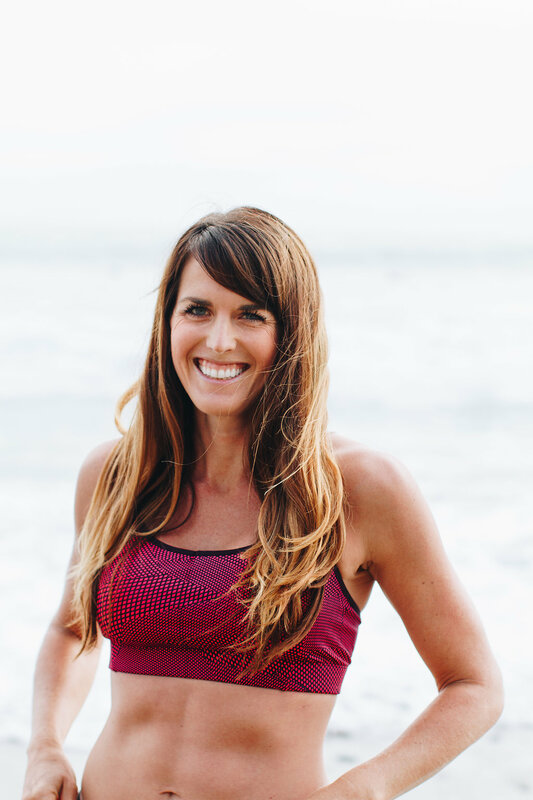 When first joining Wildfire, I quickly became obsessed with Xtend Barre, a ballet inspired strength training class, and started doing warm-heat yoga classes at Yoga6. I even tried a ballet-style yoga class (yes somehow this exists) with Asia at a studio called Movement Lab. After a while, I got into a routine with running and barre and wasn’t branching out, but once the RnR half marathon passed and running was starting to become a bit more uncomfortable, I looked to new ways to get my workouts in. I looked to Wildfire and was not disappointed. 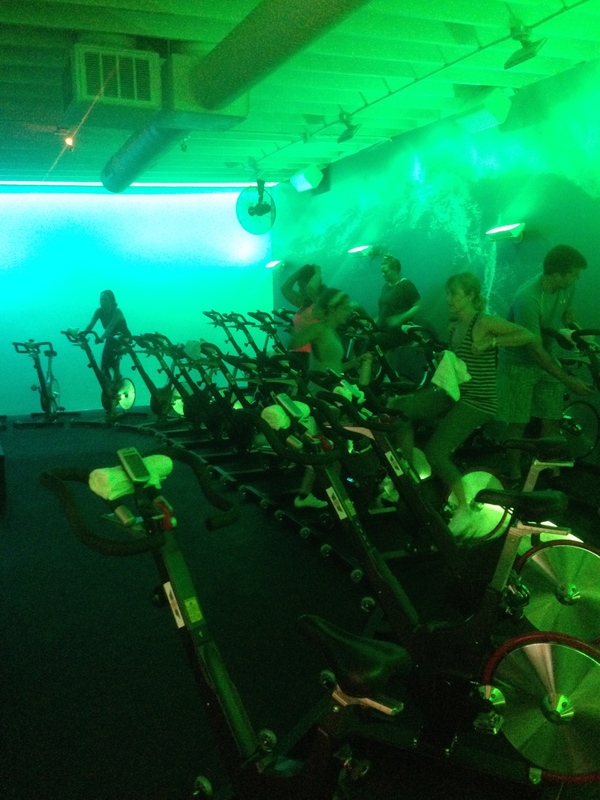 Rhythm and Power is a luxury spinning studio in Solana Beach. It recently opened its doors for the first time but is doing an absolutely fantastic job of creating a welcoming environment for new patrons. Although the classes are just 45 minutes in length, you will get a great workout in. The instructors are VERY high energy and the class is full-throttle from the beginning. The room has no windows and is kept very dark during class and the music is blasted. 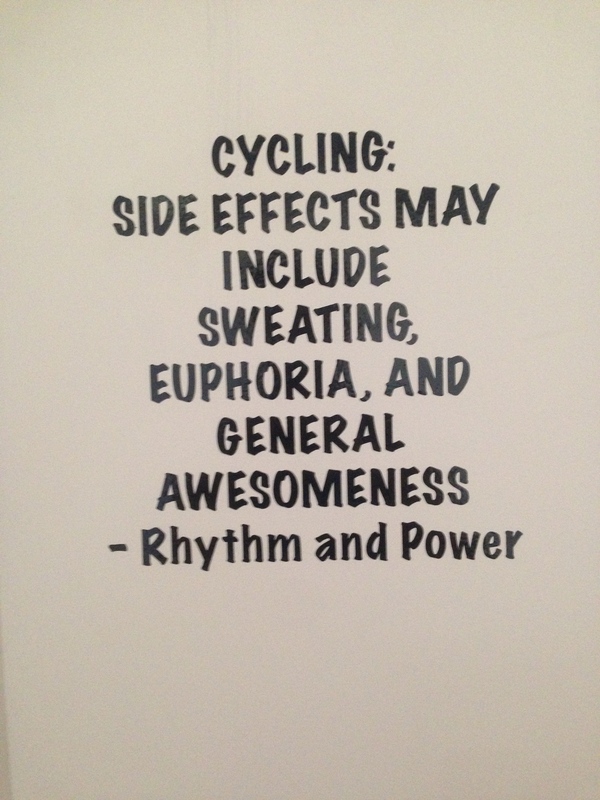 Each bike is set up with a screen that shows cadence, power and resistance and the instructors will direct you to aim for a certain cadence and give you a range of resistance to set. If you’re competitive, Rhythm and Power will be right up your alley – every once in a while the instructor will flash the rankings for the class on the flat screen tvs overhead – basically you’re competing with your fellow spinners! Of course, given that I’m nearly 6 months pregnant and I intentionally do NOT exercise at the intensity that is directed by the instructor, I’m always last or near the end of the rankings but I still have a great time. As someone who is super competitive, I can’t wait to get back into class after pregnancy and push it to the extreme! My favorite part of Rhythm and Power? The cold eucalyptus cloths that are given to you to cool off as you leave the studio (other perks: showers, free cycling shoe and towel rental, and complimentary fresh fruit!). 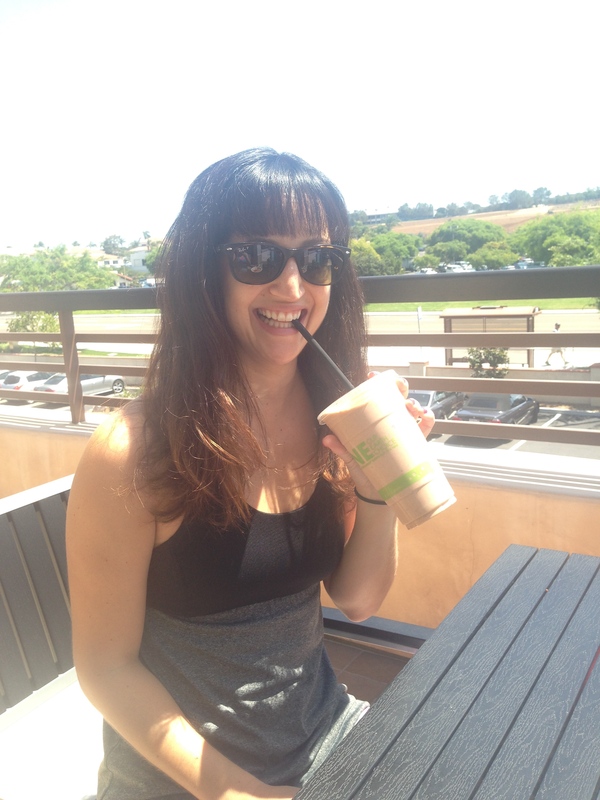 A couple of weeks ago Asia and I ventured up to Carlsbad on a Saturday morning to try out Mantra Yoga. 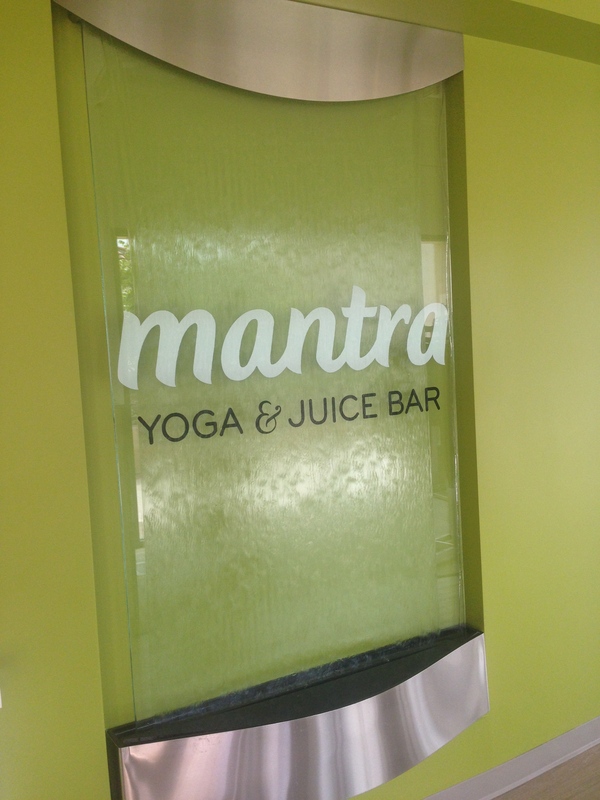 Mantra has two studios, a full juice bar and has heated and non-heated classes for all levels. These are all things a pregnant woman appreciates! So many yoga studios are all about hot yoga these days so it’s nice to have a class that I can attend. The class was literally called “Mantra Yoga 1 – Beginning Flow Yoga.” The temperature was promised to be 80 degrees and I think it may have been a bit cooler, which is totally fine with me. I really like the class – it was vinyasa and got me working but it wasn’t too hard. Often I’ve found that the only warm classes available are actually just stretching classes which means it’s not necessarily a workout, just a stretch. However, I’d consider this beginning flow class a workout! Even better, during savasana, the teacher came around and put cold scented towels on our faces. It was like heaven! 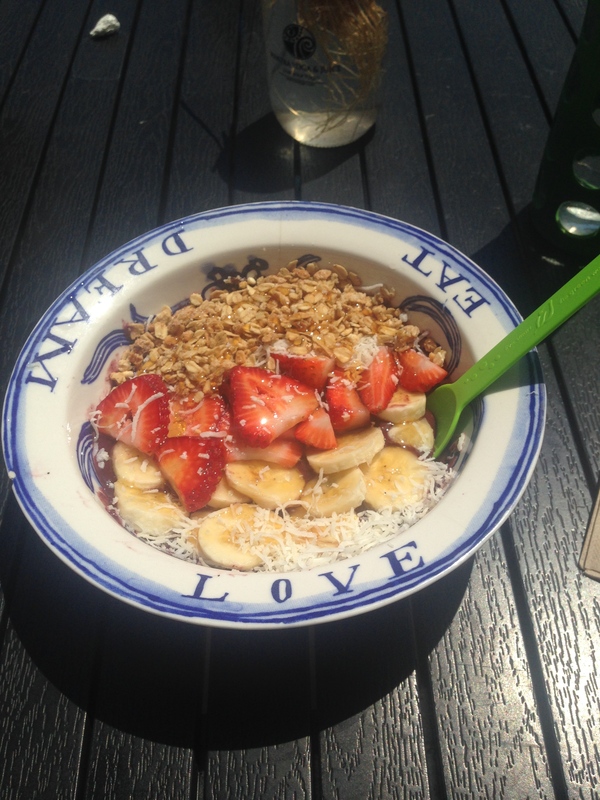 Afterward we enjoyed a smoothie (Asia) and a acai bowl (me) on the sunny patio outside of the studio (there’s also plenty of seating inside in the off chance that it’s not sunny and beautiful in San Diego). It was a wonderful way to spend a Saturday morning! If this wasn’t in the opposite direction of my work, I’d definitely be taking more classes there. For now, it’s a weekend only place for me. As you can tell, I’m a big fan of WildFire. For now, it’s only available in San Diego and Orange County, but if you’d like to join me, use code yw3xrv to receive $50 off (your first 14 days are only $1 and then it is $149/month). 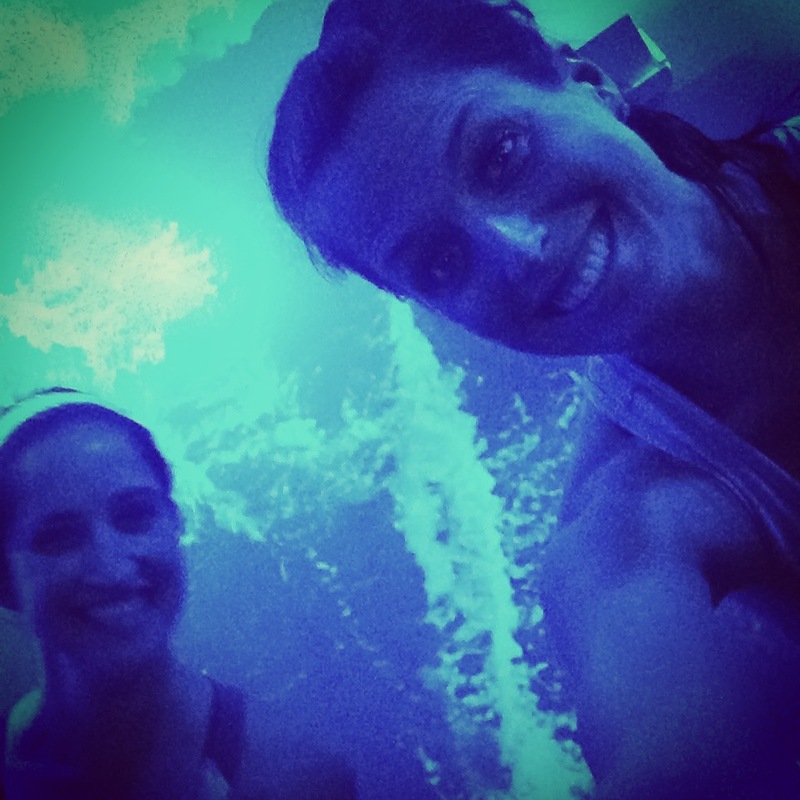 What is your favorite fitness studio perk? Do you like to hop around to different studios or do the same thing over and over?